It’s time to boost your off-road cred. 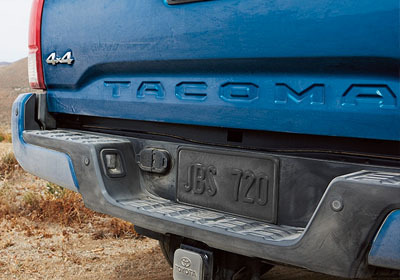 The tailgate features an embossed Tacoma logo, letting everyone know that this truck was built to lead the pack. Also features grade-specific taillights. Get ready to capture all the action. Tacoma comes standard with an integrated GoPro® mount on the windshield so you and your crew can relive all your favorite off-road adventures. GoPro® camera is not included. When backing up on a trail- or just backing out of your driveway- you need to see what's behind you. 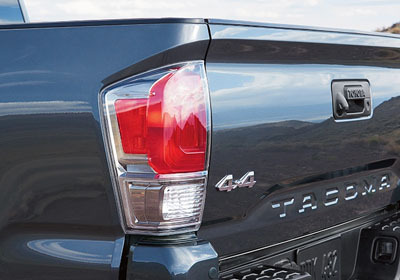 The standard backup camera mounted in Tacoma's tailgate helps you see an image of what the camera detects behind you on the available 7-in. high-resolution display. Summer heat. Winter chill. Bring it on. 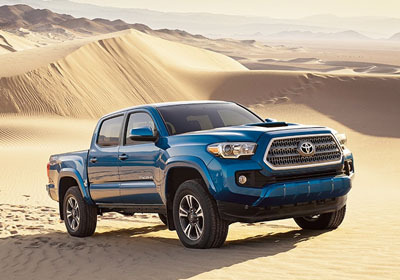 Tacoma offers available front dual-zone automatic climate control. Now you and your passenger can stay comfortable no matter what Mother Nature throws at you. When you’re towing, sometimes the wind kicks up or load shifts, causing the trailer to sway. Included with Tacoma’s available Tow Package, Trailer-Sway Control (TSC) applies brake pressure at individual wheels and manages engine torque to help maintain control of the trailer.